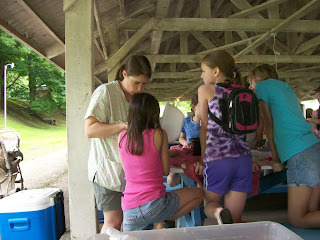 I have been really lucky the last two years to be able to teach some local Girl Scouts how to make bath fizzies while they are at his year I had a total of 95 young ladies who each got to make two bath fizzies each. It was so much fun. I got to answer all kinds of questions about my business and how to make my things and how I sell and market them as well. My mom helped us get them all wrapped up and put into organza bags, and K helped make fizzies, as the groups were large (25 girls each) and we only had an hour or so per group. So once a year my mom comes to visit and her trip just ended a few days ago. I go and pick her up and we arrived back here in PA on Sunday. C picked us up some Chinese food for dinner and it was very welcome, as we were starving. Monday we went down to Lancaster County and went to her favorite fabric store. Although it didn't have the fabric she was looking for, we did get some fabric so she can make me a skirt. From there we went on and got me some gluten free pretzels from a pretzel maker, some artisan cheeses, and some sugar free candy for C's dad. When we got back we went and saw Up in 3-D. It was very cool and the first time mom has been in a movie theatre in years. After that it was soup and salad for dinner and an early night to bed, we were whooped. Tuesday was a long day teaching girl scouts and brownies how to make bath fizzies. Dinner was salads from Saladworks. I got this great one with candied pecans and apple slices, yum! Wednesday we started with another bath fizzy class, and then during our break we went and got Rita's (water ice and frozen custard) and took a tour of the Kraemer Textile mill. It is up in Nazareth, PA and is one of the last places in the USA to spin yarn and other textiles. We had one more class in the afternoon and dinner was burgers from 5 Guys. It is my favorite place to get burgers because they not only make them without the bun, but they don't fry anything but french fries- so they are gluten free and I can eat as many as my little heart desires! Thursday was garden day. We weeded the gardens and vegetables. It was great to see that my cauliflower were making cauliflowers, and my beans had baby beans. I found three or four volunteer tomato plants and I let them go because they looked better than the ones I planted on purpose. The garlic should be ready soon and the luffa are starting to get big- hopefully I'll have some flowers soon. We went around to a bunch of local garden centers and I picked up a few pepper plants and mom got Rad strawberries for his garden at home. We grabbed dinner at Yocco's. I certainly was treating mom to all the local favorites this trip! Friday we relaxed. It was nice to sit and watch moves on the TV, relax outside in the screen room, and knit a lot. It threatened to rain all day and finally did so when we went to dinner (Mexican) and it was over by the time we were finished eating. Saturday was back home for mom. We drove the long way and stopped at a garden shop along the way whee I got some loose leaf tea and she got a new plant for her garden. Rad made dinner- awesome grilled chicken capping off a long drive with a great meal. Sunday was back home for me. I cooked a few meals for mom and Rad before I left, making their next few weeks of meal planning easier. And then drove back home as fast as I could before the rain came. 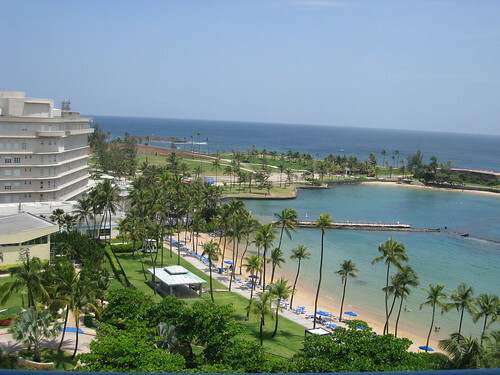 I got to go to Puerto Rico for just over a week in June. C has a project at work that brings him there quite a bit, so as long as we pay for my airplane and food, I get to hang in the hotel room while he slaves away at the office. It just took me a few days to trip and twist my ankle which kept me from doing most of the things I wanted to do the rest of the trip. But I really enjoyed getting some knitting done, enjoying napping in a hammock by the ocean, and listening to a copius amount of audio books. I hope to get to go back soon so I can explore more of Old San Juan and the are surrounding the hotel. While I was away, it rained here in PA almost all day every day, and there it only rained for the requisite hour a day, and then it passed through. Lets see here... the weekend after Mayfair K and I went to Philly to check out a show I have applied to in the past (but not been accepted to). I was disappointed in the soapmakers they had there. Obviously, it isn't the quality of my work that kept me out as much as the fact my booth display just isn't hip enough for the indie crafts circuit. I think I'll try again next year since my booth is updated to some more popular and younger colors now. I went to the dentist- no cavities!! This is always good news. I have been blessed with pretty good teeth so they are rarely a problem and I hope it stays that way, I m not fond of going to the dentist.